agilesWorkflow illustrates your individual business processes transparently in Microsoft Dynamics NAV and guides your employees through their daily work. You decide how detailed your business processes will be set and on which event in Microsoft Dynamics NAV a workflow should be created automatically. You define the start condition for the workflow. 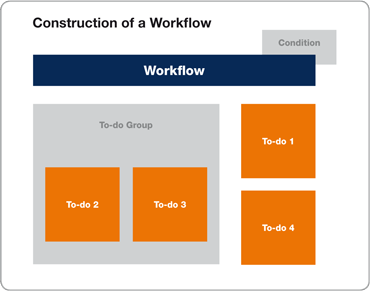 A workflow consists of at least one to-do or more than 100 to-do’s, depending from the business processes, alwasy tailor-made to fit your company. When is the to-do started? How long does the to-do take? Small workflow processes, which notify an employee, for instance, customer data has been changed, sales prices expired, credit limit exceeded can easily be mapped. To-do management, such as new item, new project, new employee, as well as complex workflow processes, like product development, invoice approval, purchase order management, sales claim process can also be created usually without any modifications to the code within Microsoft Dynamics NAV.